It was 2006 and the students of Stafford Middle School filled the auditorium, waiting in hushed anticipation for our writer-in-residence to appear. The doors burst open and a booming voice filled the space. A man, seemingly larger than life, bounded toward the stage, exploding a poem. 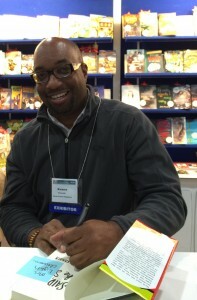 The students were transfixed – and so was I. Kwame Alexander was in the house! For the next few days, Kwame, writer extraordinaire, led writing workshops and helped teens find their voice. (All of this thanks to Kate Messner, teacher-turned-award-winning-writer, who arranged his visit.) Lucky me, my job was to make sure his visit went successfully, so I sat in on all of his workshops, learning from a master, just like the others. A memorable student quote that stuck with us and has resonated through the years: “Poetry is a get-together of emotions.” We bonded as kids poured themselves out onto blue-lined notebook paper. It was powerful. And it changed my life. Kwame Alexander is a man who embraces “YES” – he takes chances, seeks possibilities, and jumps all-in. This is why he has owned companies, wrote books, produced shows, and helped kids. Why he is now THE Newbery Award winner for THE CROSSOVER, his 2014 novel in verse. Our friendship was cemented in Brazil. Periodically, Kwame rounds up a group of writers and heads to some exotic local so they can commune with international authors, soak up history and culture, and work on their craft. When one writer had a conflict, Deanna Nikaido suggested they fill the spot with a teacher/writer. A contest was held. Interviews were conducted. And I was chosen. Brazil! How many teachers have a chance to travel with well-known award winning authors? It was surreal. I figure I would earn my keep carrying their luggage or massaging their feet. Instead, they welcomed me as an equal – sharing their words and helping polish mine. Day after day I traveled, wrote, and learned from masters. 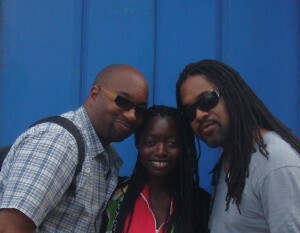 Nana and I giggled when Kwame and Randy sang impromptu songs; we all wept when Lesléa read us poems about Matthew. Since then I’ve tried channeling Kwame…seeking opportunities, spreading joy, and saying yes. I teach in a different state now, at a school for first-generation college attendees, children of poverty, and underrepresented minorities. Although my location has changed, my students still learn about Kwame, study his words, and hear his message: Say “YES” to life’s possibilities. Who knows? Maybe one day, one of these teens full of promise will share a gift of words with the world. Now when they see a shiny seal on the cover of their hero’s book – and their hero looks like them – they know anything is possible.